Norovirus particles. 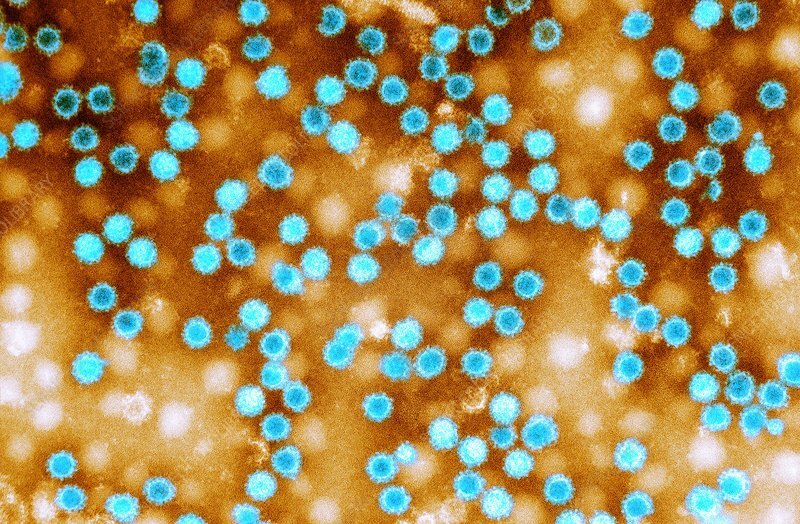 Coloured transmission electron micrograph (TEM) of norovirus particles. Norovirus is a genus of RNA (ribonucleic acid) viruses that cause about half of all gastroenteritis cases around the world. The disease is characterised by nausea, vomiting, diarrhoea and abdominal pain. The diarrhoea results in fluid loss and dehydration, which may become life-threatening in the young, the elderly, and the immunocompromised if not treated promptly. Magnification: x300,000 when printed at 10 centimetres tall.